GridSmart Fisheye Camera - J.O. Herbert Co., Inc. 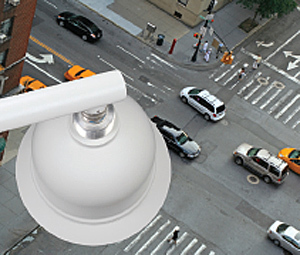 The Iconic GRIDSMART FISHEYE Camera GRIDSMART IS THE INDUSTRY’S ONLY SINGLE CAMERA SOLUTION FOR ACTUATION AND DATA COLLECTION. A single GRIDSMART camera delivers horizon-to-horizon views including the center of the intersection where the traffic actually intersects. The horizon to horizon approach gives the user flexible and complete data collection capabilities, as well as unmatched situational awareness and incident management views. The GRIDSMART virtual DVR in the GRIDSMART Client allows you to study pedestrian and driver behavior where issues arise and where views have been historically limited. Each guaranteed always-in-focus GRIDSMART fisheye camera and lens is protected by an uncompromising 1/4-inch thick hermetically sealed AMERICAN made and milled aluminum housing. The unique design gives the downward facing shielded lens 100% protection from direct sunlight, rain, snow or sand. The camera’s milled aluminum iconic GRIDSMART bell housing embodies GRIDSMART tough. GRIDSMART Fisheye cameras are torture tested because it is rough in your world. 100% of the cameras are submerged in water for 24 hours and then cooled to -55ºC after being hermetically sealed to assure their physical integrity.